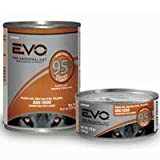 EVO 95% Meat Can Dog food is first grain-free ancestral diet that provides the benefits of a raw diet combined with the benefits of modern nutrition. Protein-rich. Low carbs. No grain. 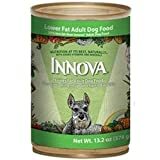 Innova Lower Fat Adult Dog Food provides all the same nutritional benefits of our regular Adult Dog Food, but with 35% less fat to assist with weight management in low activity or sedentary dogs. In addition, we included L-carnitine to help metabolize fat and retain lean muscle mass. Made with healthful ingredients from all five food groups. Includes nutrients from fresh fruits and vegetables Low in fat while still rich in important fatty acids Animal Feeding tests using AAFCO procedures substantiate that Innova Lower Fat Adult Dog Food provides complete and balanced nutrition for maintenance. 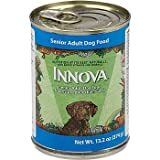 Innova Lower Fat Adult Canned Dog Food is available in 5.5 oz. and 13.2 oz. cans. 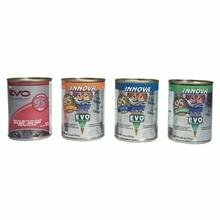 Innova EVO Dog 95% Meat Chicken & Turkey Canned Dog Food 24-5.5-oz cans EVO 95% Chicken & Turkey Canned Dog Foodis based on the proven high protein, no grain EVO formulas, and contains 95% meat including bones, fat, cartilage and connective tissue for the true carnivore in every dog. FORMULATED WITH ADDED ANTIOXIDANT VITAMINS FORTIFIED WITH VITAMINS & MINERALS If you like the idea of feeding raw, but prefer a gently cooked food that provides benefits that match raw, frozen or home prepared high-meat pet diets, EVO 95% Chicken & Turkey is the answer. EVO is the first grain-free ancestral diet that provides the benefits of modern nutrition in a safe, convenient and cost-effective natural food. Use EVO alone, or as a supplement to your raw or home cooked pet food for a completed and balanced natural feeding. EVO is an alternative for raw feeders and home-cookers.